The great thing about the outdoors is that the only thing you really need to enjoy it is an open mind and a willing heart. That said, sometimes technology comes up with some pretty nifty gadgets that allow us to experience it in a different way, explore more, or do a little better for the planet. Check out our top 5 picks below! And go have some fun. A few years ago, down puffy jackets were all the rage. Turns out that demand has led to some pretty uncool practices, such as force feeding geese and “live plucking.” United by Blue instead uses bison wool, an underutilized fiber. Plus, for every product sold, the company helps remove one pound of trash from our oceans. Very cool. Love swimming, surfing, and the water? 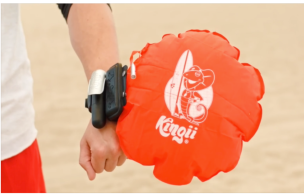 For all you enthusiasts, Kingii is an ingenious inflatable that is contained in a small cartridge that wraps around your wrist. It’s quick, fact acting buoyancy pulls you to the surface immediately upon inflation. The New York Times called it an “underwater airbag” that likely came from a James Bond film. Definitely a must-have. Tired of being amazed on how easily thiefs can cut that $100 bike lock you just bought? Well, we’ve got a fix. Fortified Bycycle claims it is the only bike guaranteed against theft. In fact, they are so confident that if any component is stolen, they’ll ship a replacement in 24 hours for free. Check it out. Too cold to venture outside? No problem. Believe it or not, you can stay in your living room and get a great work out just by jumping rope. What makes this rope unique is that it tracks your workout for you and displays in the information via LED embedded lights that create an image as you jump. Much like film or animated movies, the LEDs fire at different times as the Smart Rope rotates around you, creating the appearance of a single display floating in mid-air! No more losing (fudging) count how long you’ve been jumping! Let’s be honest, climbing Mt. Everest may be the one 2016 bucket list item that’s most likely not going anywhere. But, hey, who knows? However to experience the next best thing, a company has developed a full VR (virtual reality) experience using the Oculus Rift. It promises to be the closest thing to actually doing it–complete with the puja ceremony and the “holy sh*t” moments as you inch across a ladder spanning an ice chasm at 26,000 feet. Now the last one on this list might be a bit self-serving but we think that everyone could probably use one of these. Have you ever been hiking or camping and been trying to cook that perfect meal only to scorch it to oblivion? This small and nimble pot delivers a consistent and controlled flame for your on-the-go stove. Don’t want to carry along a bowl when backpacking? This new MiniMo pot shape is perfect for cooking and eating–and yes of course its particularly perfect for preparing a nice, steaming, deliciously filling bowl of Purely Pinole! Roadeavour has pretty good gears too.